Every once in a while, these Japanese Kit-Kats surprise me. Sometimes it’s a terrible surprise, like when something that should have a savory soy sauce taste end up reeking of maple syrup. But occasionally, it’s a pleasant surprise. Such is the case with Kit-Kat Calpis flavor. In case you’re not familiar with Calpis, it’s a yogurt drink that is sold in America under the name “Caplico.” This, one assumes, is because “Calpis” is distressingly close, phonetically speaking, to “cow piss.” Not really the association one wants attached to their beverage, yannow? I wasn’t entirely certain what to expect from this one, but I didn’t have high hopes. 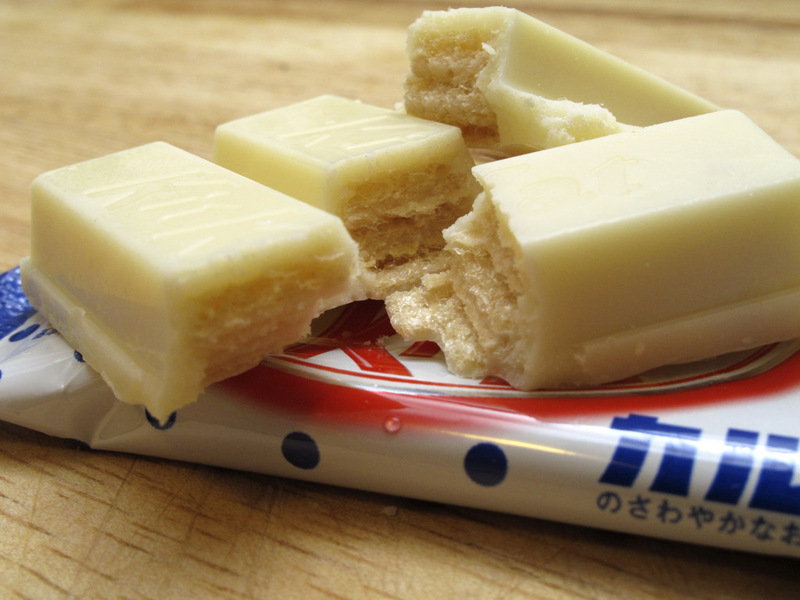 I’m not too keen on yogurt drinks, and even worse this was yet another white chocolate variant of Kit-Kat. How could a white chocolate candy meant to taste like frothy yogurt possibly be delicious? The answer: By totally not tasting like white chocolate or Calpis at all. Nope, this particular variant basically tastes like the candy bar version of a lemon poppyseed cookie. Is that rad, you may wonder? The answer is yes: It is rad. The flavor is largely concentrated in the wafer-n-creme portion of the bar, but there’s a faint hint of lemon to the chocolate as well. It’s a well-balanced mix, not overwhelming at all, and does a lot to redeem the entire concept of a white chocolate Kit-Kat. I mean, I’m not gonna run out and marry this variant or anything, but it’s good! This entry was posted in Kit-Kat Densetsu. Bookmark the permalink.